Paddy Power is a solid candidate when it comes to find a poker room on the web. There is big activity on the tables thanks to a huge player base and the sign-up bonus that can add €200 to the player’s account plus €15 in tokens are of great value. Paddy Power are genuine in its poker venture and are the sponsor of the annual Irish Open, one of the oldest poker tournaments. Rake race Twister races with a leaderboard that gives prizes to the top 250 players who will share €12,500. Missions Complete 1-10 tasks and earn slots spins or cash on the bonus wheel in the Cash Climber. 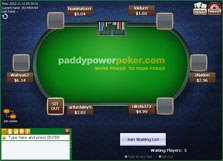 Paddy Power Poker shares traffic with Betfair Poker and other sites connected to a big network of well-established gambling sites. This results in a large traffic with the possibilities to find active tables 24/7. As usual, the majority of players are gathered on the Texas hold'em tables. There are for the most time many open Omaha-tables as well. 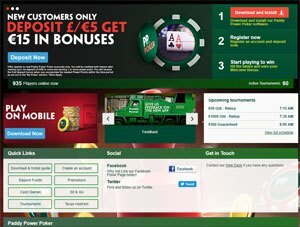 Paddy Power offers a three-part welcome bonus for all new poker players.You will get a 100% up to €200 match deposit bonus plus two €5 Twister Tokens plus €5 Mobile Heads Up Tourney. For exampel, deposit €50 and get a €50 extra plus the €15 in tournament value. In addition, your account will be credited with 30 "New Player Daily Tickets", which can be used for playing in Daily Freeroll Tournament with €50 in cash prizes. 1st part of bonus Up to €200. 2nd part of bonus €10 in tournament tokens (€5 tokens x 2). 3rd part of bonus €5 in tournament tickets (can only be used in mobile). T&CsThe minimum deposit that will activate the bonus is €/£ 10. The main bonus is claimed by earn Power Points – 70 points per 1 euro bonus. See more about Power Points below. The allowed time to clear the bonus is 90 days. Bonus points (Power Points) You will earn 20 Power Points for every €1 rake generated in cash game and every €1 paid in tournament fees. Cash game The rake up to the €0.05/€0.10 limit is 7% and above that the rake is 5%. The cap in a pot is €0,50 up to €4 depending on the limit and the players in the hand. Tournament & Sit & Go The standard fee for Multi-table tournaments is 10%. The Sit & Go fees are often 10% and for Twister around 8%. PC Windows 7, Windows 8 and Windows 10 are supported. Mobile iPhone (iPhone 5 or above), iPod Touch and Android (version 5.0 or above). Tablet iPad (iPad 2 or above) and Android based devices are supported. These are not complete listings of features in the Paddy Power Poker game client, but a selection of the most important ones. Hotkeys are not supported. 1st step Visit Paddy Power, see link above or below. 2nd step Register and create an account. 3rd step Download and install the software (mobile app can be dowloaded from website or from App Store/Google Play depending on the device). 4rd step Deposit money and start playing. Live chat Can be activated from the client or from the website. Telephone 0800 028 2497 (UK); 0044 2036369707 (other). * MasterCard that has been issued in some countries will not work for withdrawals. Paddy Power don't charge transactions. Withdrawals to credit card or bank normally take 2-3 working days to reach your account. Withdrawals to e-wallets will be processed in some hours. Paddy Power is licensed and regulated by the Alderney Gambling Control Commission. For the UK market Paddy Power is regulated by the Gambling Commission in Gibraltar. The Randon Number Generator (including shuffling algorithm) at this poker room have undergone independent third-party audit by iTech Labs. Paddy Power was grounded in 1988 in a merger of three Irish bookmakers. In 2003, a poker room was launched in addition to the sportsbook. After a merger with Betfair in 2016 the company Paddy Power Betfair was formed and is one of the biggest gambling companied in the world today valued over £6 billion. Paddy Power has during the years been somewhat of a trickster among gambling sites, and have got a lot a publicity with some controversial promotions.